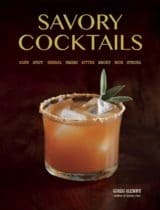 How to infuse vodka and other spirits with various fruits, vegetables herbs and spices. It’s Friday, you know what that means right? It’s cocktail time, so may I offer you a drink? But before we get to that perhaps we should talk about what’s going into it – the liquor. From vodka to brandy, infused spirits are a great starting point for a variety of cocktails. Your infusion options are endless and surprisingly easy to make. Vodka is an ideal spirit to start with since it has very little flavor of its own and offers a wonderful medium for creative concoctions but any number of spirits like rum and gin can also be infused. Pick your favorite and have fun experimenting. When deciding what to infuse your spirit with, start with combinations you know you already like. Like cooking, a good infusion is about the balance of layers of flavors so play around and create infusions with ingredients that cater to your tastes. 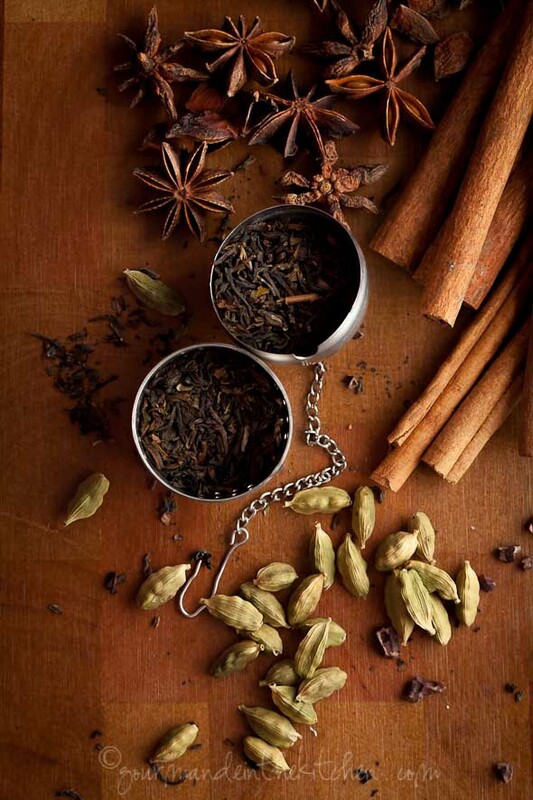 I like to add spices to fruit infusions and use cocoa nibs and even tea leaves. Leftover citrus rinds and fresh herbs from the garden find their way into my infusions as well. Fruit: citrus fruit (use the peel which contains the essential oils), cherries, cranberries, pears, pineapple, pomegranate, figs, watermelon, dried fruit. 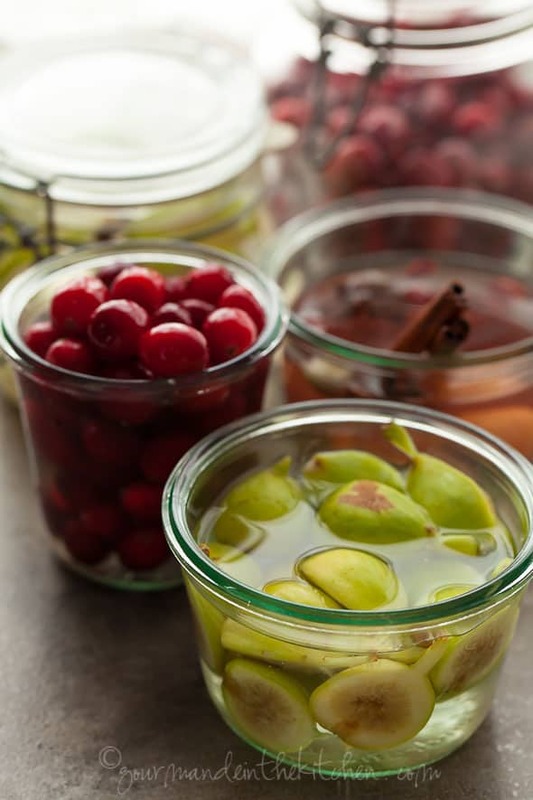 Pick out some clean air-tight jars that will accommodate your chosen ingredients. Using a few smaller jars rather than one large container gives you the ability to experiment and create a few different infusions at once. Now I don’t have a recipe to offer you here, since it isn’t an exact science but I would start out by using a modest amount of ingredients based on the intensity of flavor and check them often. If after a day or so the taste seems weak you can always add more. Wash and prep your infusion ingredients making sure to slice or chop larger ingredients into chunks to create more surface area for which the liquor to come in contact with. Once your jars are filled, add your liquor seal and wait. 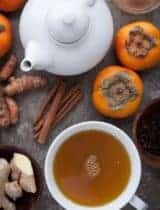 Your infusion time will also vary based on the strength of the ingredients used. Strong flavors like cocoa nibs and tea leave infuse quickly while milder flavors like fresh fruit and vegetables can take up to a week to develop. Once you’re happy with the flavor, strain the infusing agents from the alcohol through a fine mesh strainer lined with a coffee filter to remove any sediment, re-bottle and store in the fridge or freezer. Infused spirits are outstanding served chilled on their own or added to mixed cocktails for an extra layer of complexity. They make beautiful gifts as well dressed up in a pretty bottle with a handmade label and a recipe card. So how about that drink now? 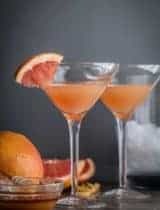 Barbara Kiebel from Creative Culinary is celebrating one year of cocktails on Fridays with a round-up of recipes from many wonderful bloggers and a few fun prizes too. Hop on over to get the weekend started off right. What lovely pictures and great ideas! I will be trying some of these, Cheers! 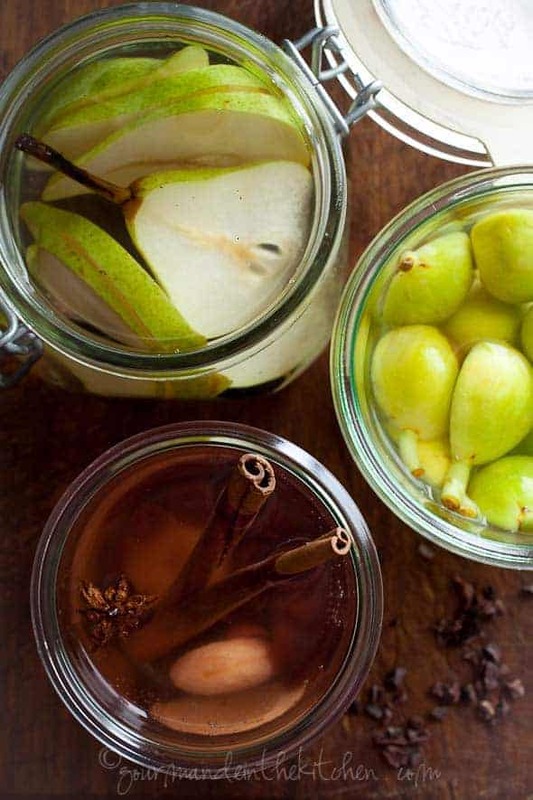 These infusions all look so good...the cinnamon sticks, mmmm, delish! And as usual, gorgeous images! TGIF! I can't ask for more than pretty photos and great drink ideas on a dreary Friday. Thanks! I love the idea of infusing vodka with fruit! All those flavored vodkas at the store are so expensive! Lovely post Sylvie and thanks so much for participating in my anniversary/birthday celebration. I've had so much fun doing infusions and making liqueurs that I simply have no room at the inn but you've got some great ideas and I'm sure you've inspired someone to take the plunge. They won't regret it! I don't usually use vodka in drinks, but infused ... I may give it a try. I love the idea and all those jars and bottles around with an exotic fruits and herbs... :) And yes, I am ready for a drink! Love the look of the one with those little figs! I imagine that would turn out so delicate and sweet. Cheers to you Sylvie. Everything you touch turns to gold! I love how you did this ... it's brilliant. That's a great ready reckoner for flavours and infusions. 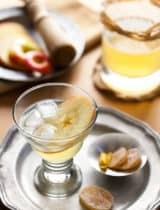 great post Sylvie, I've only infused Vodka with vanilla beans, I would love to try it with fruit. Thanks for posting this now - I hate to say it but good idea to get making now for Christmas! 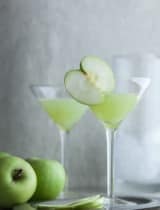 The coffee filter paper is a good idea because even the littlest bit of sediment from things like pear can make the spirit go brown. Gorgeous pics as always. Wonderful fennel gratin, Sylvie! And I've done some infusing, but loved reading your tips on different flavor combinations. Such fun! I need a drink right about now! 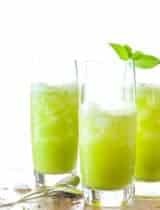 This post gives me a lot of ideas to get creative with vodka! Love the simple, yet beautiful styling of your photos. 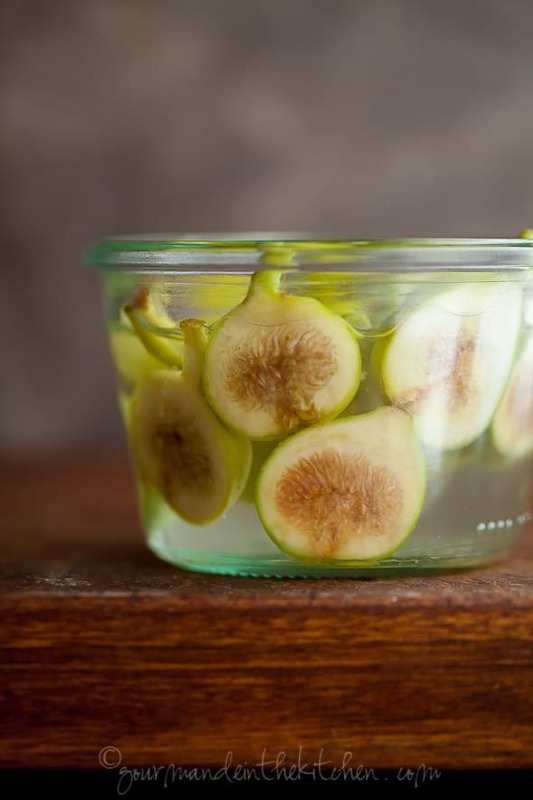 Love the post on infusing! We're planning on doing some more of these on TBC. I can't wait to give this a go. I bought quite a bit of vodka recently to make vanilla extract but hey, I think I need some infused vodka experience. Great post. These photos are so gorgeous! I've been meaning to make my own vanilla extract with vodka, but now you've given me so many other ideas! A very interesting post, Sylvie! Thanks for sharing :) Hope you had a "Cheers-ful" weekend! Fantastic post Sylvie. I'm going to try the brandy and figs! I made a blueberry-infused gin this summer. Now you have me wishing I had made more! Lovely photos and flavor suggestions! Thank you for sharing the ideas! I don't drink much so I'm clueless in terms of all the lovely drinks - I love the infused vodka idea! You take great pictures and makes the process more approachable to anyone! Beautiful! Especially the shots with the infusing (is that grammatically correct?) figs. oh wow! what more can i say but WOW! Would love to try this, especially love the idea of making for presents. All your combos sound fabulous but I'm thinking something with rosemary since I have heaps of it in my garden! What gorgeous pictures, S! Perfect cocktail to enjoy a Friday evening with. Obviously I'm not into infusing with spirits and the like!! But I just wanted to say how gorgeous your photos are as always. It's tuesday, but it's still cocktail hour somewhere. I love this idea as opposed to buying all kind of flavored vodkas that I wouldn't use very much. I think infusing and I would get along very very well! Great post! I love everything about this. I experimented with gin and cucumbers this summer. Quite delish. We have friends who always have a bottle of pineapple vodka in their freezer. I love the idea of pears - your photos are beautiful! Lovely. 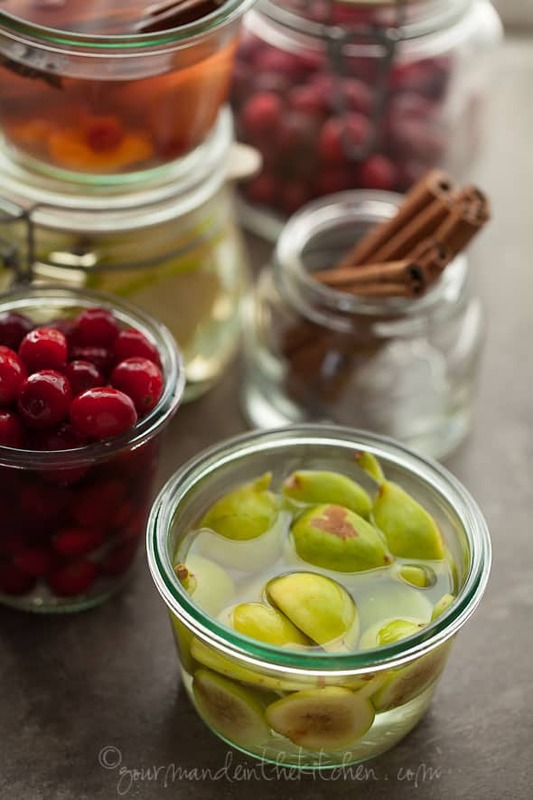 Not only am I drooling over the infusions but also the Weck jars. :) I'm a simple girl and pretty jars are just necessary. Great post. Now to raid the liquor cabinet. Blackberry brandy sounds wonderful, I'll have to try that! I made a habanero vodka last year and I think its been one of the family favorites (from those who like spicy foods). Great photos and what fun flavor suggestions you have! 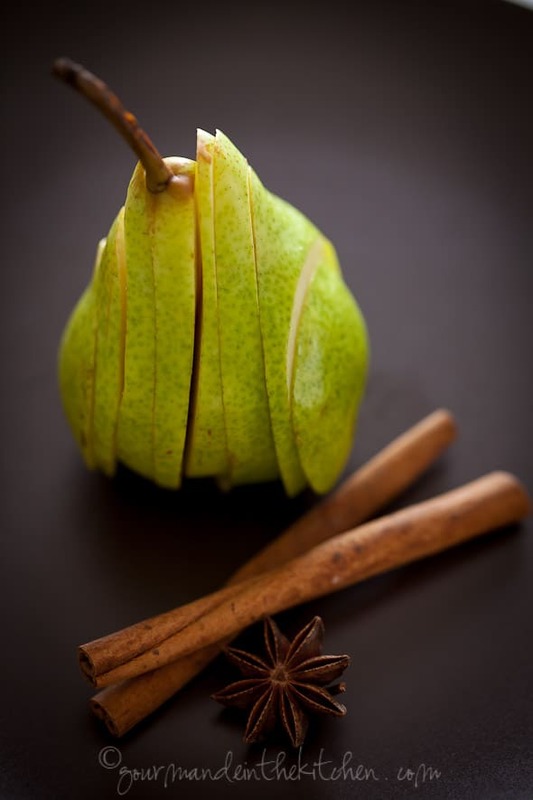 Hi there, I've been experimenting with various fruit-infused vodkas and rums, but now that fall is here I want to do something like cinnamon/vanilla/pear. 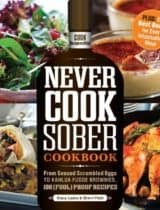 How many vanilla beans and/or cinnamon sticks do you recommend using per cup of alcohol? I want to make sure I don't over or underdo it! Thanks! This is a beautifully photographed post. 1 cup isn't very much alcohol to infuse, I'd start with just a couple cinnamon sticks and maybe one vanilla bean and then let it sit for a week and taste and add more if you think it needs it. Hello! I have a question - if you're using a fruit or vegetable, do you have to refrigerate the liquors or are they okay in a cool, dark pantry? 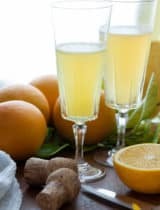 I've done with ginger for a great ginger drink over the holidays (ginger-infused vodka, ginger beer, and a piece of candied ginger) but I wasn't worried about it spoiling! Thank you!! Hi Laura, I've left fruit to soak un-refrigerated without any problems as long as they are completely submerged in the alcohol and tightly sealed but you can certainly store them in the fridge while they infuse if you'd prefer and you have the space. Beautiful post. I'm just getting ready to do a limoncello with a spice combo I stumbled across making muffins last week. I usually just make lemon muffins for my other half because I'm not a big fan, but I ate nearly all of these and just made some more. Got me thinking how else I could use the combo and I thought topping one of the muffins with berries in some limoncello with the same flavors would be pretty good. Been a while since I'd made limoncello, so I thought I'd better refresh my memory. Your post is by far the most mouthwatering, and has enough diversity of suggestions to satisfy even my flavormania. Will be putting this to good use--be making the fig for my other half. Thanks!